I grew up on a NH farm and have a deep connection to the earth and wholesome food. I obtained my A.S. in Culinary Arts from Strafford University in VA, and after working in the preparation side of food for 20 years decided I wanted to make a difference in the production of food. I believe that we need to find balance in our food supply and gain a greater understanding of the complete system that puts food on our plates. I received a BS in Sustainable Agriculture and Food Systems from UNH in 2015 and am continuing toward a MS in Agricultural Science. 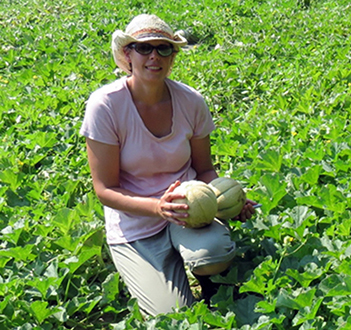 I am studying the use of vegetative grafting of melons to interspecific hybrid squash rootstock for season extension in melon production, as well as evaluating the affect of different irrigation regimens on fruit quality.